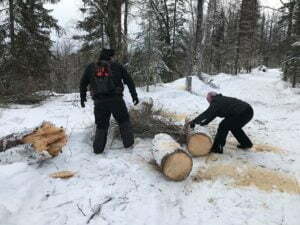 “Thank you Randy for clearing out the majority of the trees on the Chulitna Bluff Trail and the E/W Express. 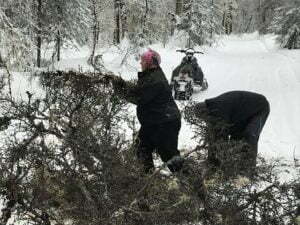 It made it a lot easier for us to cut them back further, completely clearing the path for the snowcat to groom. This is going to be an ongoing problem in many areas due to the beetle killed spruce. Chulitna Bluff Trail from 121 to 131 is obstacle free at this point, north loop from 131 down to Reflector tree is in great shape, Reflector tree back to the highway on the E/W Express required cutting a couple more trees back. Trails are FANTASTIC (thanks Randy) and nearly bump free. Great for introducing new people to the sport and great for getting those break-in miles on your new whip without breaking your back. Oh yeah, special thanks to my son Justin and daughter-in-law Charity for pitching in.